We are a renowned organization engaged in offering a comprehensive range of Needle and Syringe Destroyer to our clients at leading prices in the market. Offered products are manufactured in accordance with medical guidelines, using optimum quality raw material, procured from authorized sources of the industry. Further, we make sure to examine the quality of the entire range before delivering these products to the clients end, in order to ensure their compliance with international quality standards. 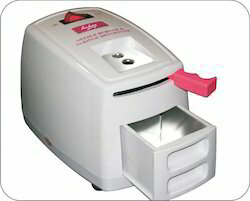 Offered products in this range are Electric Needle & Syringe Destroyer, Manual Needle & Syringe Destroyer and Three In One Needle & Syringe Destroyer. 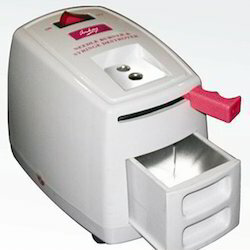 Amkay products proudly to introduces 1st time in India Needle Syringe Destroyer with Buzzer while burning the needles which indicates total burning of needle and cut the disposable syringe nozzle easily. 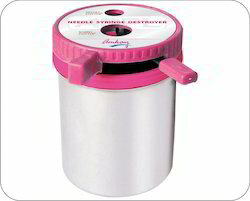 Needle Syringe Destroyer with 3 in 1 operation in single body i.e. burning of needle cutting of syringes and manual cutting of needle are also provided in case of electricity failure. Our machine has strong metal body with powder coating for longer life.